About a quarter of the cases, and 5% of the total foreclosure filings, end in retention. While that might not sound like much, it’s worth bearing in mind that in many instances, there is a significant power imbalance between the homeowner and their lender. 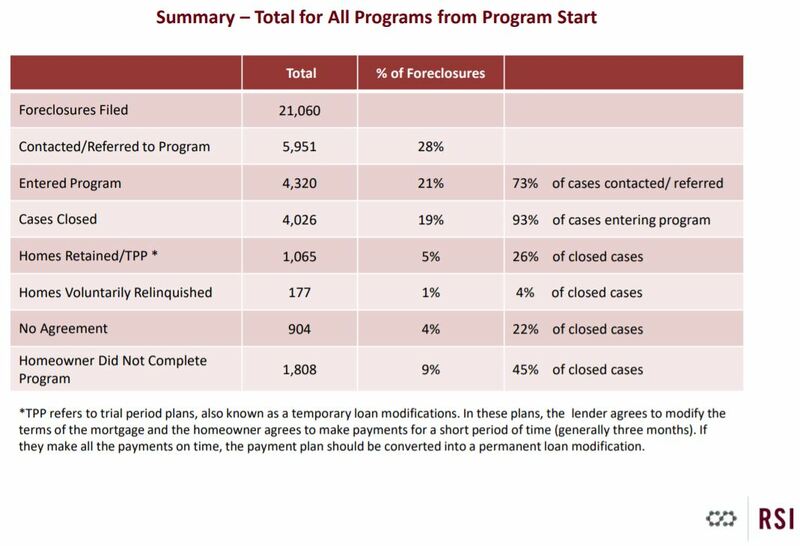 That fact makes it quite possible that without the guidance provided by the housing counselors and attorneys, and the channels of dialogue between borrower and lender opened by the program staff and mediators, these homeowners would have very little chance of prevailing in the traditional judicial foreclosure process. Therefore, a retention rate of that magnitude is a tremendous victory. We’ve also come to view these programs as a victory for nuanced dispute system design. By monitoring and evaluating eight independent and distinct programs across the state, we’ve been able to see how much process impacts outcomes. As our Director of Research Jennifer Shack points out in the May issue of the Court ADR Connection newsletter, those programs which automatically enrolled participants (allowing them to opt-out, rather than requiring them to opt-in) and had low barriers to participation had much better outcomes. On average, the programs that were opt-out with low barriers had over triple the participation rate and home retention rate of the programs with high barriers and/or an opt-in model. The notion that lower barriers increases access to justice is an intuitive one, but this is great data to support that claim. Access to justice advocates will want to keep an eye peeled for RSI’s full-blown evaluation this fall. I believe these victories highlight why a number of Illinois courts are choosing, even in a climate of tightening belts, to continue funding these programs. We anticipate that a majority of the programs which were funded by the Office of the Illinois Attorney General will continue on after the grant funding expires in August. That’ll be something of a happy ending for a state that was so deeply impacted by the foreclosure crisis. This entry was posted on Friday, June 1st, 2018 at 9:07 am	and is filed under Foreclosure Mediation. You can follow any responses to this entry through the RSS 2.0 feed. You can leave a response, or trackback from your own site.